Its time to start thinking about birthday gifts, and end of school gifts. Of course the kids are going to be looking for the latest cool toy on the market. You may want to surprise them with Hovertech. 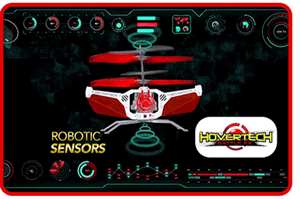 Hovertech is a shooting based toy. However, instead of it being where the good guy is shooting the bad guy the approach is different. The kids get to shoot soft foam darts at a Hovertech target that looks like some sort of spacecraft. The big deal is that the Hovertech target has sensors built into it, so its going to move when being shot at. This is what really creates the challenge for the kids. The claim for Hovertech is that it creates target challenge shooting. This is a great way to get the kids away from the violent type shooting games. Kids are always going to be interested in the various forms of weapons on the market. So why not channel that interest into a safe competitive form of shooting an object. They hype revolves around the Hovertech setting up the challenge with its built in sensors.It is electronically controlled so there is no complaints that this is a toddler’s toy or too easy. The cost for the Hovertech is $19.99 plus shipping and handling.It contains the Hovertech blaster, the Hovertech target and the eight Hovertech darts. At first the commitment may be handing the Hovertech over to the kids. Of course you will want to try it out at first to make sure it is safe, and how it works so you can explain it to the kids. But, really just who are you buying the Hovertech for? There is another commitment that comes with the Hovertech. It is a shooting game so all of the standard precautions have to be taught to the kids. The main one being they are not to aim the Hovertech at anything other than the Hovertech target. Also, nobody should be standing behind the Hovertech target at the time of shooting. The Hovertech has been built with safety in mind. The darts are made of soft foam. The blades on the Hovertech target are made of soft plastic. At the same time all of the precautions that have been outlined in the commitment must be followed,as well as whatever the parents feel are necessary. The concept of the Hovertech is a good one. In the sense that it channels the desire for shooting to something that is not as violent as what many of the video games are. We are going to give the Hovertech a try/buy review. The feedback on it so far is mixed. There are several that like it and others that don’t. Some of the complaints are that you can not use it outdoors. It is because the Hovertech target is light and flies too high and can fly away. The other complaints are that it doesn’t hold its charge long enough. However the TV promo says it holds the charge for 30 minutes. Some say it only stays charged for five minutes then there is a twenty minute wait for it to recharge. However, there are many that say they are quite pleased with it. If you are looking for an outdoor toy that is different and has some intrigue to it then you may want to take a look at the My Fly Birdie. What do you think? Does Hovertech work or not? Does the Forever Book Really Work?